The Cormeilles family, who still held the manor in 1170, probably built St John’s Church, Elkstone or ‘Elkestan’ as it appears in the Great Rolls of the Exchequer of 1177. By 1291 the Rector of Elkstone received all the tithes of the parish (10% of agricultural produce) except for small portions granted to local religious houses and also to Fontenay Abbey, Calvados. The Rector did, however, dispute Fontenay’s right to this! John of Acton had succeeded to the manor of Elkstone by 1316 but, just 6 years later, Elkstone was in the King’s hands because of John’s involvement with the Rebellion. The Poyntz family succeeded to the manor later in this century. By 1376, a 3-field rotation was the agricultural practice in the parish. 29 people in Elkstone were assessed for the Poll Tax of 1381, these notorious taxes provoking the Peasants’ Revolt of the same year. Elkstone remained in the Poyntz family until 1539 when it was sold to the Huntley family and, by 1623, it had passed to the Craven family. Court Rolls for Elkstone Manor Court survive for the period 1571-1609 and the earliest register at Elkstone commences with a baptism on 7 April 1592. It was recorded in 1572 that the church “wanteth glasinge and pavinge and whiteliming”. By 1700, Elkstone had grown substantially with 35 houses and 160 inhabitants, some of whom could supplement their income by keeping the wildlife down – payments are recorded for foxes 1/-, polecats and hedgehogs, 4d each and sparrows, 3d a dozen. During the century when mineral wells were discovered at Cheltenham, 1718, and the first mailcoach began from Gloucester to London, 1785, Elkstone received two celebrated visitors. Jane Austen made several visits to the Rectory and Samuel Lysons, the Archeaologist, excavated a Roman Villa at Combend. 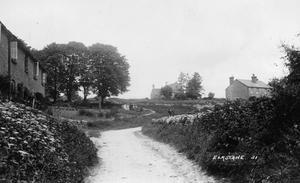 The 1800s brought with it some major changes for the village – the Cheltenham to Cirencester Churn Valley road being constructed in 1825 and an Enclosure Act for lands in Elkstone in 1835. The population by the middle of the century had grown to 336, the first O.S. map of Elkstone was printed in 1883, and the century concluded with an earthquake felt over much of Gloucestershire. In 1912 the village of Elkstone “was excited by the sight of an aeroplane, most of us had not seen one before” and, in the same year, special hymns were sung in the Church for the loss of the Titanic. 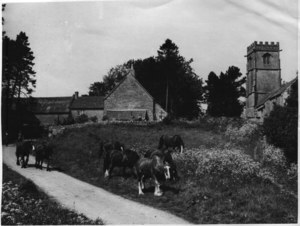 The ancient Cotswold parish of Elkstone, with its ‘high wild hills and rough uneven ways’ (Rich II), was recorded in the Domesday Book in 1086. 840 candle-lit years later, in 1926, electricity came to Elkstone. The rest is history! 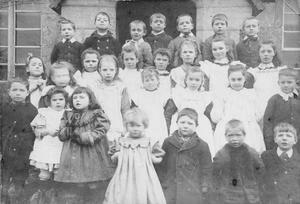 School Children outside The Old School House, which is still there. Approach from the south towards The Old School, situated just right of centre in the far distance.